Size: 20cm x 15cm x 15cm. It is also available in custom size, color and designs. 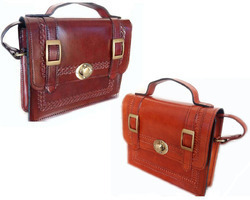 Description: It is 100% handmade leather. 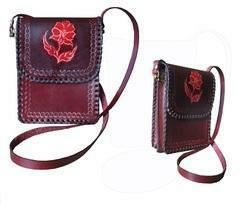 It is stamped design on leather. There is two zip section and two open portion. And closed magnetic button. It is also available in different color & design. 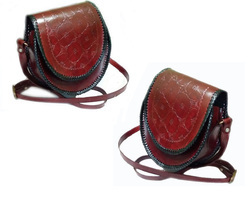 Name : HandMade Leather Sling Bag With Trun Lock. Code No : HLC 001. Description : It is handmade buffolo leather and stamped desinge on the leather .We did lining by cotten faberic.There is one zip packet inside bag. 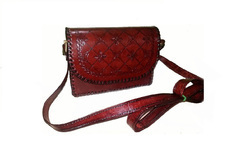 Looking for Handmade Leather Sling Bag ?